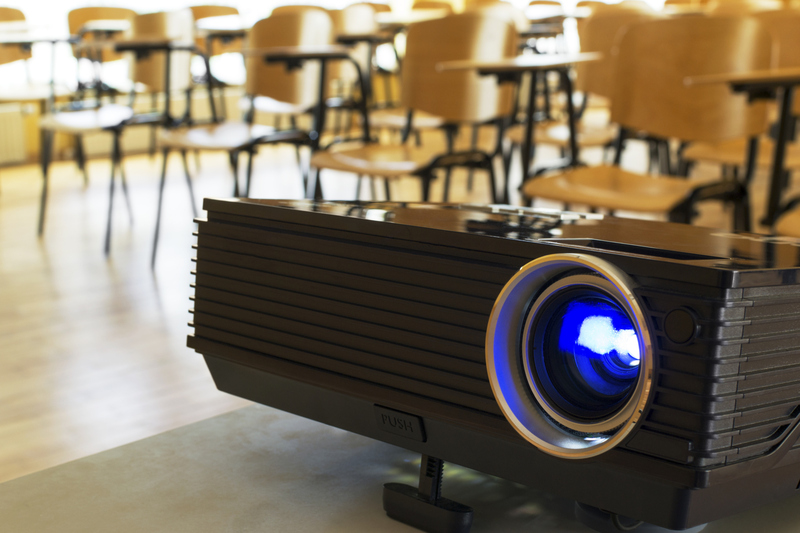 When it comes to projectors, finding the right one can be a taxing situation. There are a lot of factors to consider, like lumen output, portability, projection distance, image projection size, connectivity, etc… Thankfully you have people like us who make nifty lists like this one that informs you about the current projectors sitting at the top of the market. You’re welcome. This is one of the least expensive ViewSonic projectors that still performs like a champion. The smaller price tag is probably mostly due t how small it is, but this means that it is super portable. it weighs just short of 2 pounds, and it is 13.1 x 10.4 x 4.3 inches. You can take it with you to all of your business meetings or events with little to no hassle. The lamp can reach up to 800 lumens. As long as you can control the lighting a little bit, you can use this projector in any room you want for any reason. It has an SD slot, an HDMI input, a USB slot, and a VGA output for laptops. You can connect just about anything to it that you could think of. 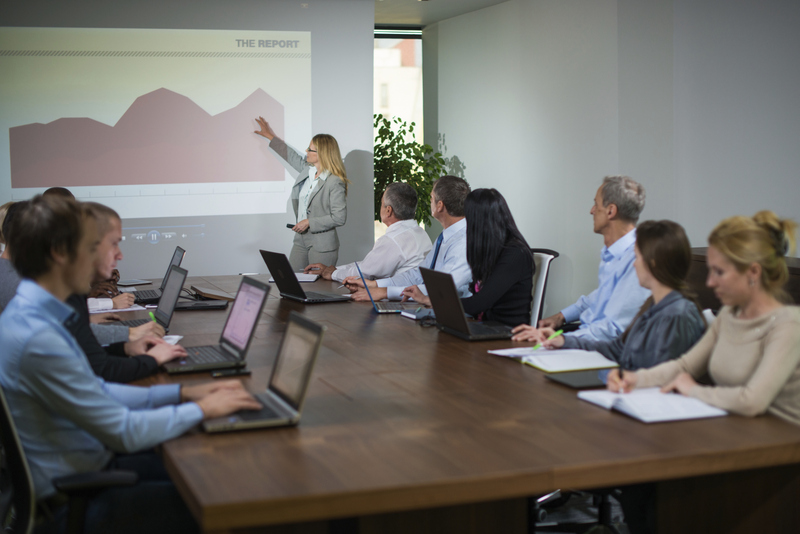 This is an great choice for presenting documents from Word, Excel, and Powerpoint presentations directly from a USB flash drive. It can also play video of course, but that isn’t a strong point. Either way, for the money, it’s really hard to beat. Especially with the portability. This is another super portable projector that is great at doing just about everything. It’s also a little cheaper than the ViewSonic PLED-W800, and if you shop around a little bit you can get it for a steal. It has a ton of amazing features, which is why it made it on the list. It measures 11.6 x 11.9 x3.0 inches and weighs about 5 pounds. So like the Viewsonic model, you can easily take the EB-X11 from place to place and take care of business anywhere you need to. One cool feature is the lens cap that automatically shuts off the lamp and the speakers when it is put on. 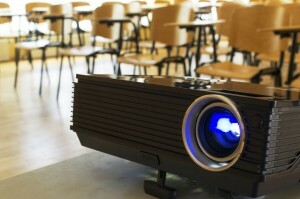 The lamp has a really high brightness for this type of projector, with a rating of 2600 lumens. It does have USB slot, but for some reason you can only view photos with it and not videos. Other than that, this is a really great projector and the brightness and size make up for it’s little flaws. And even the flaws are pretty easy to get around. This model isn’t very portable at all, but that isn’t what it was made for. It weighs about 26 and a half pounds, so you probably wouldn’t want to move it anyway. It measures 15.3 x 19.8 x 5.8 inches. This model is also the first 3LCD projector, but the projection chip it uses was made popular by other companies. It does not use a lamp at all but instead uses a blue laser light source. This is very convenient, but we all know you pay a price for convenience. This bad boy is going to cost you an arm and a leg. It goes for about $11 grand if you’re planning on buying as opposed to renting. It has a brightness of 4,000 lumens and can last for up to 20,000 hours. This means you don’t have to change lamps as often. It also has a full set of BNC/component inputs, an RGB D-sub 15-pin slot, DV-D, monitor output and an HDMI input. On the other side of the projector it also has S-video, composite video, lots of analog audio ins and outs, an RS-232C control jack, the DC inlet, and wired LAN. With all of those features you would think that it would have built in Wi-Fi, but sadly it does not. This is a small price to pay for all of the other crazy features though.